This hula hooping thing is far more complicated than I originally thought. I've got my first hoop done and have been trying to practice and watch the videos on You Tube; but I still don't have it down. I guess I need to practice more. We think we are going to get a video camera soon because we gave Bob a glider ride for his 45th birthday and he would love to take video to document this flight. 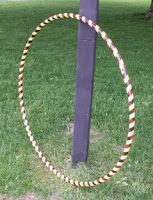 So, if we do, I may be able to post my own hooping video or at least my progress. We'll see. 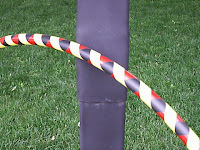 I still want to make a slightly heavier hoop when I can find the right tubing sold by the foot. I just don't want to buy a whole roll.